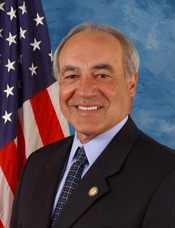 Joe Baca won election to the U.S. House of Representatives in 1999, in a special election to replace one of California’s longest-serving Members. Since then, the former semi-pro baseball player has become a primary advocate to diversify America’s business leadership and has helped procure funding for institutions working for the country’s minority students. 1Politics in America,2002 (Washington, D.C.: Congressional Quarterly, Inc., 2001): 144–145; Lauren V. Burke and Mary Shaffrey, “Rep. Baca Joins the 106th,” 1 December 1999, The Hill: 12. 2“Official Biography of Joe Baca,” http://www.house.gov/baca/meetjoe/bio.htm (accessed 16 March 2010); “Mayor Pro Tem: Joe Baca, Jr.,” http://www.ci.rialto.ca.us/citycouncil_285.php (accessed 25 May 2010). 3Patrick J. McDonnell, “State Assembly/San Bernardino and Riverside; Diversity of Districts Helps Make Contests Competitive,” 24 May 1992, Los Angeles Times: B2. 4Jerry Gillam, “Eaves’ Foe Looks to Willie Brown for Help,” 7 May 1988, Los Angeles Times: 32. 5David Wert, “Battle to Succeed Brown Taking Shape,” 30 July 1999, Press Enterprise: B4; Politics in America, 2002: 145. 6Politics in America, 2012 (Washington, D.C.: CQ-Roll Call, Inc., 2011): 146. 7Garrison Nelson and Charles Stewart III, Committees in the U.S. Congress, 1993–2010 (Washington, D.C.: CQ Press, 2011): 568; Claire Vitucci, “Inland Members Get House Assignments,” 10 January 2001, Press Enterprise: B6. 8Onell R. Soto, “Adjournment Vote Note on Baca’s Agenda,” 19 November 1999, Press Enterprise: B6; Almanac of American Politics, 2010 (Washington, D.C.: National Journal Group, 2009): 248. 9Politics in America, 2006 (Washington, D.C.: CQ Press, 2005): 155; Politics in America, 2008 (Washington, D.C.: Congressional Quarterly, Inc., 2007): 155. 10Almanac of American Politics, 2010: 248; Almanac of American Politics, 2006 (Washington, D.C.: National Journal Inc., 2005): 283, 285. 11Politics in America, 2012: 146. 12“Official Biography of Joe Baca,” http://www.house.gov/baca/meetjoe/bio.htm (accessed 16 March 2010); Almanac of American Politics, 2004 (Washington, D.C.: National Journal Inc., 2003): 275. 13Official Biography of Joe Baca,” http://www.house.gov/baca/meetjoe/bio.htm (accessed 16 March 2010); as quoted in Politics in America, 2002: 144. 14“Election Statistics, 1920 to Present,” http://history.house.gov/institution/election-statistics/election-statistics/. 15Leslie Parnilla, "Island Empire Politician Joe Bacca Calls It A Career With Latest Loss," 11 November 2014, San Bernardino Sun, http://www.sbsun.com/government-and-politics/20141109/inland-empire-politician-joe-baca-calls-it-a-career-with-latest-loss (accessed 31 August 2015). Oral History: 2013, 1 video and 1 transcript. An oral history interview conducted with Joe Baca by Edwin Perry. Topics discussed include Baca's service in the U.S. Army from 1966-1968. "Joe Baca" in Hispanic Americans in Congress, 1822-2012. Prepared under the direction of the Committee on House Administration by the Office of the Historian and the Office of the Clerk, U.S. House of Representatives. Washington: Government Printing Office, 2013.